FULL SPOILERS for The Defenders lie below. Here we are, after 2 years, 5 seasons, and 4 Netflix series’ we have arrived at the big event, the series that is supposed to bring everything together for a showdown of epic proportions, the ‘Avengers’ of TV if you will. 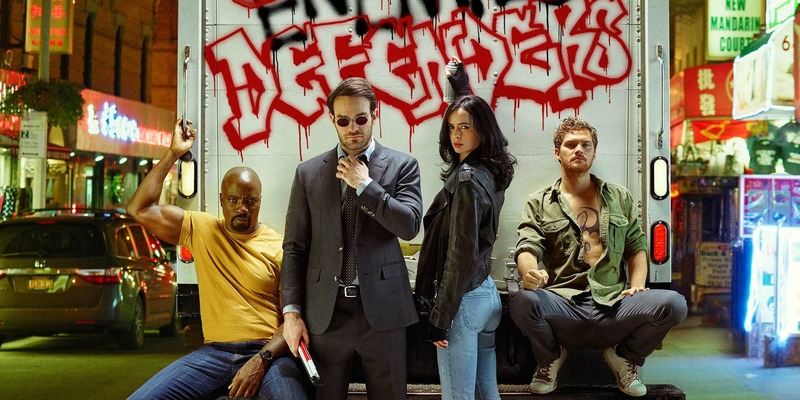 Now where there is plenty to love about this culmination of your favourite TV superheroes Daredevil, Jessica Jones, Luke Cage, and Iron Fist, it is riddled with flaws that result in The Defenders being underwhelming and at times quite boring. The Defenders starts off on a very sour note, the first two episodes in particular set the show up for disaster, but fortunately the middle episodes are vast improvements that provide plenty of entertainment. But again that is short lived as the series ends on a very poor note capping off a largely disappointing 8 episode run. I will start with the beginning of this event miniseries that takes the entire first two episodes and much of the third to reintroduce us to our four heroes and show us how they happen to come together. This was a very slow, uninspiring opening to the series that didn’t feel like anything new, our main characters keep their unique and engaging personalities but if that’s all i wanted to see i’d revisit their solo shows again. There are brief crossovers with supporting characters but i just found following the individual stories of our heroes wasn’t as interesting as i wanted it to be. It was like a miniseries made up of portions of four other miniseries’ that just jumps around between each of the heroes doing their own currently seperate thing. And i get it, you want to explain how and why our heroes will all find themselves facing a common enemy, but the way they went about it in the first few episodes was quite dull and boring. A few things do stand out from these first few episodes though, the evolution of Iron Fist’s character in this series is a big improvement over his representation in Iron Fist, and this carries through more or less to the end of this series. Despite overall really liking his solo show, Danny Rand wasn’t the strong, enthusiastic hero i was looking for. That changes in The Defenders as he looks to have more initiative and at times is the most rational thinker in the team. I think the fact that he and Luke Cage have a great back and forth dynamic going on helps to bring out a bit more flair in his character, making him a little more interesting and enjoyable to watch. The biggest and well… ‘only’ exciting moment of the first two episodes is the first meeting between Iron Fist and Luke Cage. Despite how dull the rest of the episode was the fact that one short fight sequence between two familiar faces can turn that frown upside down in an instant is amazing. The third episode is where things start to really kick off for the show…. finally. There are glimpses of greatness throughout the episode that ends with an incredible action sequence which is by far the best one of the show………… unfortunately. This is where The Defenders brings in a large focus on Elektra (Elodie Yung) explaining how she was reborn and why the hand or more specifically Alexandra (Sigourney Weaver) has bought her back. I loved Elektra’s scenes especially her training sequence where she carves up 12 ninjas in the dark with little to no effort, but i will talk a little more about Elektra in full later on. We start to see more of the dynamic between Jessica Jones and Daredevil which involves many snarky comments and a tonne of attitude which is fun to watch, it’s a great contrast to the Iron Fist and Luke Cage relationship. The bulk of what i like to call the ‘transition episode’ of this series is fine with great moments spread throughout including the big final moment. This sequence unites the Defenders for the first time as they fight their way out of the Midland Circle building against a large number of armed guards and of course, Elektra. Seeing all of their various powers and fighting styles play out in the one scene is why i was looking forward to this show and this sequence paid that off excellently. Then we break off into episodes four, five, and six which are the three best episodes of the show and what i wanted all 8 to be like. In episode four, after taking shelter in a nearby Asian restaurant and trying to introduce each other our four heroes are joined by Stick who had just escaped the clutches of The Hand by cutting off his hand. This wasn’t an action heavy episode but it was just very fascinating finally having all our defenders in one place interacting, talking, and clashing which is what i wanted to see. Through this episode we learn a lot about the history of The Hand, their origin, and who exactly Alexandra is….. essentially an evil woman and one of the five ancient creators of The Hand who is in search for the substance to bring her eternal life. The episode ends with The Hand finally tracking them down and we get a truly epic scene where for the first time all the Defenders are standing in formation with a common goal setting the scene for another epic showdown. And then we get episode five where the showdown teased at the end of the last episode was decent at best. The next two episodes do a great job at introducing us properly to the five fingers of The Hand which include Madame Gao, Alexandra, Bakuto (who is not dead anymore), expendable character #1, and expendable character #2. We learn a little more about their order, their history and exactly what they want with the Iron Fist. We get a connection back to Daredevil’s series when we find out that the evil Midland Circle building is located on top of the giant sinkhole Murdoch previously stumbled upon. There are many more Elektra scenes such as her reliving memories from her past life, as she is quickly becoming the highlight of the series. These are just two very strong mid-season episodes that end with an intense, exciting, and dramatic sequence which results in Elektra killing Stick in front of Daredevil before incapacitating the Defenders and finally capturing Iron Fist. And then just when you think that is the big moment of the episode, Elektra blatantly disobeys Alexandra’s orders to kill the defenders and kills her instead with her trusty Sai. After all that greatness we make our way to the final two episodes that rather than going out with a bang decide to go quietly into the night. The seventh episode is actually pretty decent, the majority of the episode takes place within the police station and where the action seems to have come to a stop you do get some pretty good character moments going into what should have been an explosive finale. The last 10-15 minutes of the episode is great, seeing the defenders go up against the three remaining fingers of the hand was an exciting fight sequence but when considering this is the penultimate episode it was pretty mediocre to be honest. And then we get the finale, the episode meant to close out the series with a bang and the best and biggest action sequence so far. But nope, i mentioned earlier the excellent fight sequence in episode three was the best and even after this episode that hasn’t changed. Everything this season has lead up to this one moment where we have Colleen Wing and Claire Temple ensuring the Midland Circle building goes down in a giant explosion and we have the Defenders going down into the hole to rescue Iron Fist and defeat The Hand once and for all. This final showdown was just ok…… Luke Cage, Iron Fist, Daredevil, and Jessica Jones taking on faceless men and Madame Gao was fine and decently choreographed but i wasn’t super pumped like i was earlier in the show. By this point it was just more of the same and a very underwhelming fight sequence that more or less goes where you expect it to go. The Daredevil vs Elektra finale was the saving grace of the sequence though as finally seeing these two characters who have a tonne of history come together to settle their differences was cool, a little emotional, and at least engaging unlike the rest of the sequence. And then following the fight sequence the show just fizzles out, sending everyone back to their respective shows with Daredevil pulling off a Superman and dying but not dying at the same time. What i wasn’t thinking about going into this series was how much of a role Elektra would play in the main story as i had my eyes so focused on Sigourney Weaver’s mysterious villain. Now where within the story the one pulling all of the strings behind the scenes is Alexandra who was a fine villain the real threat throughout the show is Elektra and if it wasn’t for her this show would have been an utter disaster. Her storyline and character arc from the first episode to the last was the most fascinating story by far. Her transition from being reborn to becoming the Black Sky, to questioning her purpose and alliances, to turning her back on Alexandra, and to taking matters into her own hands against Daredevil was infinitely more fascinating than anything the heroes were up to. Whenever she was on screen i loved the show ten times more and i’m being serious, without her story holding this series together it would have been a colossal failure. So in the end, there is a lot more that happens in the first season of The Defenders that i could go into in detail but then i would be here for a really really long time, and it’s just not worth it. Overall this was still a borderline good series that offers up much of what you wanted from this Marvel Netflix crossover event. You get the action, the hero team-ups, great character interaction, and all that good stuff sprinkled throughout the show but mainly within the middle few episodes. A slow and dull start coupled with an underwhelming finish holds this series back and places it behind all of Marvel’s previous Netflix shows in terms of quality and entertainment. Even the series’ best episodes don’t compare to any of those in Daredevil or Jessica Jones so i think for now i’d rather stick with the standalone series’ while they try to figure out a more effective way to execute these ‘big’ event shows.